Three executives have been arrested for alleged negligence resulting in the collapse of a local subway tunnel in Shanghai in July that cost the city about 150 million yuan (US$18 million). The arrests followed an investigation into the accident, which found improper management and inadequate emergency response measures were to blame for the cave-in on July 1 during construction of a cross-river subway tunnel. 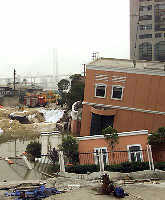 The collapse caused nearby land and buildings to sink . "It was a serious engineering accident," said Jiang Lan, spokesman for the city government, over the weekend. According to Jiang, those arrested included Li Zhuhe, assistant project manager at the Shanghai branch of Beijing China Coal Mine Engineering Co (BCCMEC), and Yuan Qianghua, project manager of Shanghai Tunnel Engineering Co (STEC). The two companies are building the tunnel. Li Guanqiang, chief supervisor of Shanghai Metro Consulting Supervision Science and Technology Co which is supervising the project, was also apprehended. Three others from the companies blamed for the accident are currently out on bail, awaiting further judicial proceedings. Authorities have also downgraded the three firms' qualification status for urban construction projects. They claim the staff facing charges had failed to take remedial action in response to technical problems in the equipment used to build the tunnel. Flaws in the engineering plan as well as inappropriate on-site management and engineering supervision allegedly contributed to the accident. The investigation team, which included senior specialists, based its conclusions on in-depth field and technical assessments and analyses, Jiang said. Top managers in related companies have also been punished, according to Jiang. STEC general manager Zhang Yan and a deputy general manager at the same firm were dismissed from their posts. Zhou Huai, general manager of Shanghai Metro Operation Co, and Zhu Renwei, general manager of Shanghai Urban Construction Group, were given demerits on their administrative records. State authorities have also suggested administrative penalties for other top executives in organizations like BCCMEC and China Coal Research Institute which were involved in the project. Work on organizing insurance payouts for the accident is well advanced, Jiang said. "The rail route will not be changed (despite the accident)," said Liang Wei, an expert with Shanghai Tunnel Engineering and Rail Transport Design Research Institute. "However, a specific repair plan will not be worked out until late October or November when construction work in the damaged tunnel can resume," he said. The tunnel is being built for a metro line M4 that will link areas west of Shanghai city centre with Pudong district across the Huangpu River. Construction began in 2001 and trials are scheduled to begin on the line in 2005.